3M Precision Masking Tape is made specifically to help you deliver sharp, clean and precise lines. While using any polish, glaze, sealant or wax you risk permanently staining the trim if you are not careful. Simply put the tape around any area you want to protect and you can detail with confidence and know your trim is protected. The ultra thin smooth paper backing that this masking tape is made of, makes this tape ideal for protecting paint, trim, emblems, lights, adjacent panels and more when using a buffer. Another great feature of this tape is that it feels "stretchy". This stretch allows you to easily cover corners and edges that need protecting all around the car with clean and smooth lines (i.e. headlights, trim, grill pieces, etc.). 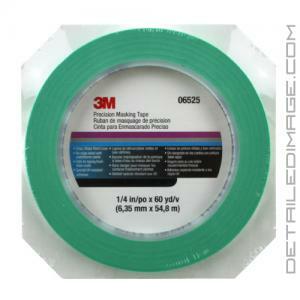 If you are looking for a great masking tape to help you protected trim pieces when polishing, the 3M Precision Masking Tape is a great choice! The best tape on the market. Very easy to use and is very flexible and durable. Having both sizes is key, but this is my favorite tape for doing corrections and headlight restorations. For headlight restorations you need a tape that is flexible and easy to conform to the angles and curves of a headlight. Look no further, this is the tape you need. Very easy to remove and no issues with residue after removal. This tape is super high quality. Its got good adhesion but doesnt leave residue behind. Nor does it bleed off residue if bumped with a machine polisher. I highly suggest you give it a try if your used to the traditional painters tape that detailers have been using for the last however many years. Great adhesion but doesn't "pull" on delicate trim like the window seals on 996/997's. Flexible enough to stretch and hold to moderate contours. Doesn't seem to roll its edges like the paper-type masking tapes when you run against it with a DA.